NASA wanted questions, so I gave them one. I’m not expecting to hear back from them. Of course they won’t answer. 1971 is ancient history. The parents of the young adults in charge of answering that blog were children in 1971. “Noone pays no longer for ice age scare so noone talks about it. 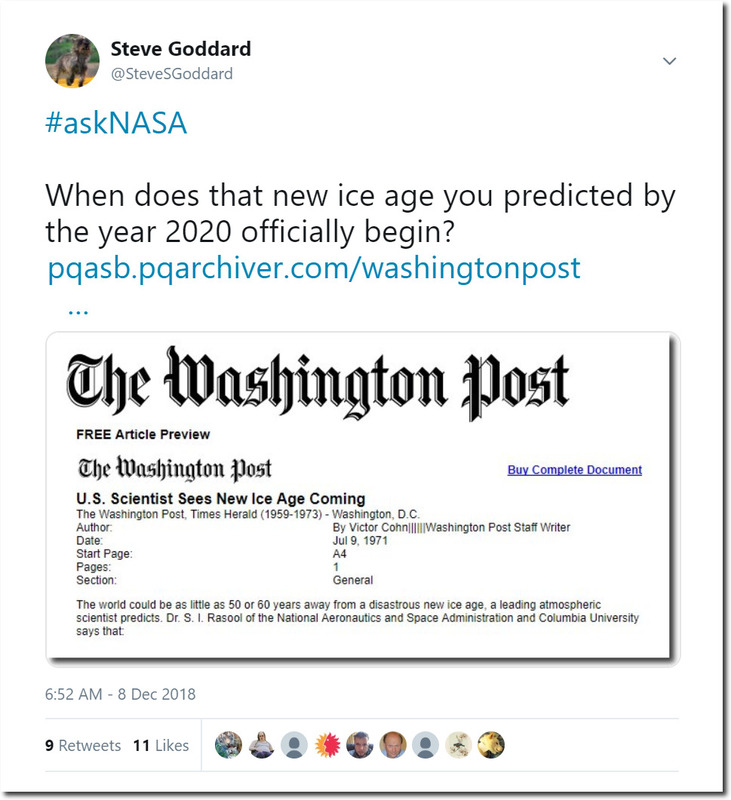 Since the global warming looneys of the Ice Age Scare are now the normal and the Ice Age supporters became the looneys we will follow the money(how scientific).. This is the result when you create submissive,greedy buttkissers at universities. Dr. S. I. Rasool is one of the two NASA scientists, authors of a very interesting article that appeared in Science (1971). They explain that the CO2 greenhouse effect is saturated. This is why all alarmist models contain positive feedback loops not found in nature. They know damn well that more CO2 is not going to overheat the planet. CO2 is a coolant .. CO2 has a very high emissivity to IR, especially in the 4µm and 15µm bands. High emissivity molecules are used in all coolants because of their high conductivity. That is why Argon is used in double paned windows and not CO2 or water vapor (which is also very high emissivity). Every skating rink in North America uses CO2 to freeze their ice because it saves them around 40% in energy costs by doing so. CO2 at the top of the atmopshere (TOA) radiates to space. Increasing CO2 would increase that. In fact, water traps are used, indeed must be used, in order to use IR absorption spectroscopy to measure CO2 in air. Without these traps, water, especially its variability, interferes with the IR absorption spectrum of CO2. That’s what one suppose considering that we had 10*++ more co2 millions of years ago and there was no runaway effect. How can something that failed to start this effect at its peak can now do this with 90% less inside the very same system. The climate clowns are just like all other political flip-floppers. They were against Global Warming before they were for it. Rasool, I think in 1971 was promoting that particulate carbon in the atmosphere was a cooling influence. He used some of the “modeling” by James Hansen, who later promoted that such carbon contributed to global warming. It would be rewarding to catch Hansen definitively claiming that carbon caused cooling and then warming. Can anyone ask or is it just US citizens? I think I’ll ask how CO2 controls the climate now but followed temperature changes during ice ages in the past. This has all been a set up. CO2 has been framed. An innocent molecule has been set up as a patsy. I read about “saturation” years ago but no one talks about it. Same for the Vostock ice cores showing CO2 following temperature not leading it. Why are these findings not leading arguments? You should apply for an NSA grant with that proposal and see what happens. It was never about science. From the very beginning this has been a kangaroo court, out to convict us. If you pay someone to prove that A+B=C, C will always be the answer that you get. They are not interested in the truth. Note that the two greenhouse gasses demonized are CO2 (which we exhale) and Methane (which we fart). No matter how much money politicians have available to squander, it’s never enough. The whole global warming scam has been a UN/Globalist attempt to justify taxing humanity for breathing and passing gas. “Breathing Tax”, the ultimate collectivist dream! Whoever said evolution was aimed at improving things? It has been a set up. In a free society/economy there is no need for Big Government. The money changers in the temple would lose their power. So to stay in power constant conflict/chaos/scarcity/fear has to be created and maintained. CO2 is just 1 of the many tools to achieve that goal. The money changer are the cancer of a healthy free society. Considering this video I would regard your answer with skepticism if you ever get one. Seems NASA is more about science fiction than reality.